218 pages | 2 B/W Illus. This book describes the relationship of Christian Public Theology to other religions and their ways of contributing to the common good. It also promotes mutual learning processes in public education to strengthen the public role and responsibility of religions in pluralistic societies. 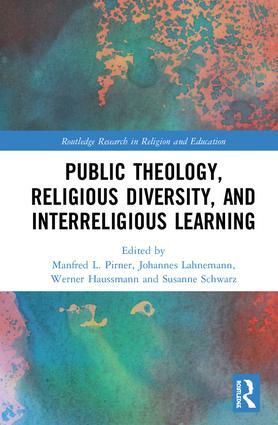 This volume brings together not only public education and public theology, but also scholars from a variety of disciplines such as philosophy, cultural studies, and sociology, and from different parts of the world. By doing so, the book intends to widen the horizon and provide fresh impulses for public theology as well as the discourse on public religious education. 9 Monotheism – Curse or Blessing? 10 Public Theology and Interreligious Dialogue. 14 Islamic Education in Europe: An Opportunity for Equal Rights or a Way to Control Islam? Manfred L. Pirner is Professor, Holder of the Chair of Religious Education, and Director of the Research Unit for Public Religion and Education (RUPRE) at the University of Erlangen-Nuremberg, Germany. Johannes Lähnemann is emeritus Professor of Religious Education at the University of Erlangen-Nuremberg, Germany, and Chairman of the Peace Education Standing Commission of Religions for Peace (RfP). Werner Haussmann is senior lecturer at the Chair of Religious Education at the University of Erlangen-Nuremberg, Germany, and Deputy-Director of the Research Unit for Public Religion and Education (RUPRE). Susanne Schwarz is senior researcher at the Chair of Religious Education at the University of Erlangen-Nuremberg, Germany, and Coordinator of the Research Unit for Public Religion and Education (RUPRE).